The recently crowned International Brand Ambassador of the Year at the 2016 Spirited Awards knows a thing or two about Scotch serves. As the curator of the Chivas Masters cocktail competition and former bartender himself, globetrotter Max Warner gives Becky Paskin the lowdown on coconut water ice cubes, Mexican bartending, extending Scotch communications to women and The Littlest Hobo. ‘I’ve been doing my job for 12 years and I’ve been given so much trust now; it’s a big responsibility and I get to be creative. ‘I have always believed that Scotch whisky has a place in the best bars in the world. This category has not been recognised within an audience that strives to develop the best drinks through innovation, service and genuine hospitality, until now. I am very proud to represent Chivas and the trust I have been given by my team has allowed me to create a voice, which I hope I can now develop further. Winning the award for Best International Brand Ambassador (at the 2016 Spirited Awards) is nothing short of epic; the proudest moment of my career. ‘My focus is on running the Chivas Masters cocktail competition, which is not like any other competition I’ve seen. It’s important for me to make it ownable and unique. ‘I love storytelling, so I want to make sure what we’re doing is relevant, educational, inspiring and builds advocacy for the future. It’s not a given any more with a brand like Chivas Regal – we don’t just get loads of money; that’s not how it works. I have to pitch my ideas to the business, then I get funding based on what I bring back. At the end of the day, we’re trying to ensure our tone of voice is relevant for the bartenders and that that translates for consumers. ‘I introduced a unique idea this year, which was to make sure that in order for a bartender to win, they had to inspire a whole team to help them in the final. I’ve been in this industry for 22 years – I won a competition in 2003, which was for the best bar team in the UK, and it was sponsored by Chivas, so I’ve now come full circle. I’ve been to a few bars since then and I think I know what makes a good bar team. 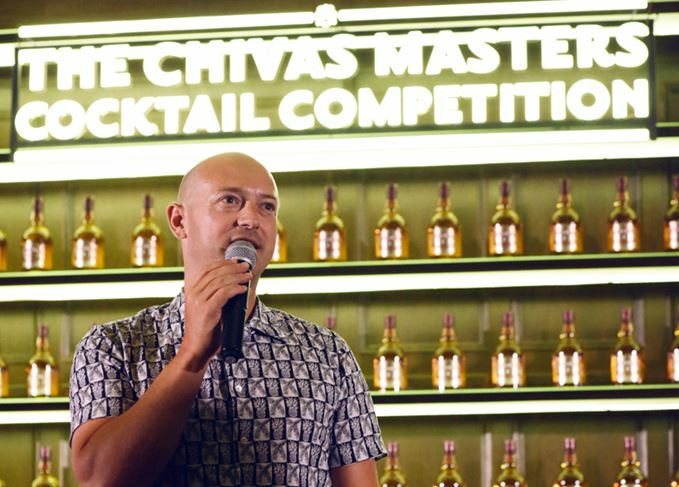 ‘The competitors in the Chivas Masters final this year were judged on elements of their teamwork, as well as their performance, hospitality, ownership of skills, use of local ingredients and inspiration. ‘The team had to create three cocktails inspired by their local market, New York and Shanghai. I wanted to chart the journey that Chivas took around the world. It first left Scotland to launch in New York in 1909, then during Prohibition when Chivas disappeared, wealthy people in New York travelled to other cities so that they could drink, and also to find Chivas which increased our demand in other cities. ‘By 1932 when Prohibition had finished, Chivas realised demand had grown considerably and they couldn’t keep making a 25-year-old, so they went back to the drawing board and recreated the blend as a 12-year-old, which launched in 1939. Chivas cracked Shanghai in 1994. The story of the Chivas Masters is charting the journey that Chivas Brothers has taken. ‘Everything that I do is new, in the sense I see it as an opportunity for me to learn more. ‘The 2016 Chivas Masters winner was Alejandro (Alex) Millan Ponce de Leon, who is the first Mexican to win an international cocktail competition. Alex was just calm, and very consistent right the way through. When I look at him now against the past winners, there’s definitely a nucleus of something that I identify in someone in this competition. There’s a humility, a calmness, a real enthusiasm for wanting to develop themselves and letting me help them do that, which is great. ‘There are still markets I go to where I’m back to the drawing board and I know that. What I mean by drawing board is that they can’t make cocktails and still drink whatever their father drank. There’s a lot of that in Latin America where they are happy to just drink it on ice with soda, so there’s no cocktail arena. ‘One of the things that’s changed a lot with Chivas is we’ve gone from being a luxury brand, to being able to actually try to use the power from our distribution channels, our recognition and iconic status, to start bringing to life this social element, and developing people’s understanding of the brand. ‘My favourite analogy is that I love Jimmy Choos, but that doesn’t mean I wear them. It’s the same with Chivas – it doesn’t have to be about the product experience, it’s the brand association. If we can get people into that through drinking and trying it through a cocktail, that’s great. ‘Six years ago I discovered people in Brazil were drinking whisky with ice cubes made from coconut water. I find that fascinating, and while that’s been going on for years, so many people still don’t know about it. When it comes down to it, providing you have a nice glass and good quality water or ice, you really don’t need very much else because that creates a really nice drinking experience on its own. ‘Chivas is an easy-to-drink whisky. If you let it dilute a little bit more you do taste the softer flavours. It’s not for connoisseurs, but we are developing our range to a point where we are putting a lot more flavour behind it, and it’s becoming more challenging for people. ‘Because of the way the brand operates so differently in so many areas, my job is not just about talking to the on-trade; I’m a consultant across our team, so I’m now learning a lot more about social media for instance. That for me is a really interesting area to get into. I don’t feel we have our tone of voice right on social media yet. I’m experimenting with ideas on our global pages but we haven’t got there yet because there are so many different people around the world. ‘The Chivas Masters will move from Shanghai to Tokyo next year, because Chivas is in a great position there. We’ve got a limited Chivas Mizunara edition that we produce just for that market, and we recently increased our price for the first time in 20 years. Japanese whisky has done a lot to make Japan interesting from that perspective. There is a real association with respect and sophistication that you can’t take away from the whisky category. It’s never going to be a white spirit that targets everybody; it’s only going to be appealing to a certain type of person with discernment, and that’s what makes it interesting for me. ‘We talk about gentlemen a lot, but I’d like to see a better understanding across the board for men and women appreciating it. I know they are there, but as a brand we always focus on the modern gentleman. That’s the “olde worlde” bit that I hope to be a part of changing. ‘What makes me me, is being able to talk about something I’m really passionate about to other people, to travel and meet others. The most challenging part of being a global brand ambassador is being able to do that job and also nurture my relationship at home. I’m really lucky to have someone at home who’s there for me at the end of the phone and sends me messages all the time and keeps my side of the bed warm. Scotch whisky is as significant as any other spirit at this annual New Orleans cocktail festival.